Production difficulties might force Apple to push back full manufacturing of the widely rumored "iPhone 8" into October or November, severely impacting overall iPhone shipment estimates for the second half of 2017, according to KGI analyst Ming-Chi Kuo. In a note to investors on Tuesday, Kuo said industry checks show signs of a "worst case scenario" for iPhone shipments, with production of the hotly anticipated "iPhone 8" potentially delayed by two or three months. Apple usually ramps production of its iPhone product in August or September to prepare for high demand during the annual fall launch cycle, which traditionally takes place in mid-September. This year, the company is believed to announce an OLED-equipped iPhone variant alongside iPhone 7 series updates, though production ramp of the high-end model could be pushed back to as late as October or November. "In other words, severe supply shortages may persist for a while after the new models are launched, capping total shipments of new iPhones in 2H17F," Kuo says. The analyst does not specify what issues stand in the way of production, but a report last month claimed partner supplier Samsung hit a snag in manufacturing OLED panels bound for the handset. Like Kuo's current assessment, the prior report cited a one- to two-month delay in Samsung's production of OLED hardware for Apple. Separately, rumors from Apple's supply chain suggest the company is having difficulty integrating its Touch ID fingerprint sensor into the handset's display. Some industry watchers, including Kuo, expect Apple to utilize a below-screen Touch ID solution with "iPhone 8," allowing for the deletion of iPhone's home button in favor of a full-face screen with so-called "function area." Supply constraints are nothing new for Apple. When the iPhone 7 launched last year, the company experienced unusually high sales of the dual-camera iPhone 7 Plus model. CEO Tim Cook in an investor conference call discussing the second fiscal quarter of 2017 said Apple was unprepared for the shift in demand, which led to supply constraints and lower overall sales. A more apt comparison may be AirPods, which debuted at the iPhone 7 event in September ahead of planned retail sales in October. Apple missed its announced launch window due to unforeseen delays that pushed back availability to December. Six months later, AirPods are still sold out, with orders placed today estimated to arrive in six weeks. An "iPhone 8" delay, however, would come with consequences to Apple's bottom line, as analysts expect the device to drive an iPhone "supercycle" later this year. Buffering for the potential downside, Kuo says iPhone shipments could hit 80 million to 90 million units in the second half. That figure is down from the analyst's previous estimate of 100 million to 110 million units, which itself is more conservative than consensus of 100 million to 120 million units. 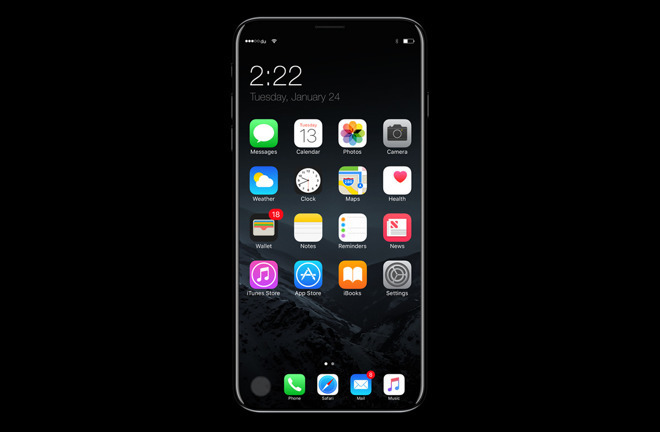 Apple's "iPhone 8" is predicted to boast an all-new "glass sandwich" design featuring an edge-to-edge OLED, custom 3D sensing cameras, wireless charging and more. Packed with new technology, the flagship device is expected to come with a premium price of more than $1,000.